Time: Boy Scout program – 8 a.m. to 4 p.m.
WHY: For an awesome day of science, technology, engineering, and mathematics fun! Cost: $10.00 per youth and Leader/Adult. Includes: Lunch (pizza,soda, & cookies), STEM U patch, and NOVA patch. Payment: Mastercard, VISA, and Discover. Payments and registration will only be accepted online. Registration: Registrations will be accepted no later than Friday, December 14, 2012. NO late registrations or walk-ins will be accepted. Boy Scout participants will be capped at 250. First come, first served. IMPORTANT: They only have room this first year for 250 Cub Scouts, 250 Boy Scouts, and 100 Venturers. Registration will only happen online and it closes on Friday, December 14th. 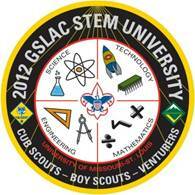 STEM U Contact: Tom Kroenung, tkroenung@stlbsa.org, 314-256-3096. Open doors at 8 a.m., Opening ceremonies at 8:30 a.m. Program sessions: 9 a.m. to Noon & 1 p.m. to 4 p.m.
Scouts will have their choice to pick from the list below for one morning session topic and one afternoon topic. They should choose one NOVA award to work on and one Merit Badge. They can also do two NOVAs if they wish. All awards are offered in the morning and afternoon other than Composite Materials which is all day. Scouts will need to have proof of earned merit badges with working on the NOVA award. They should bring a ‘copy’ of their cards not the original. An individual Scout registration form will needed to be printed and submitted before Friday, December 14th with the Scout’s choices. The pdf will be available to download with the email receipt after registering and will share what requirements are due before the event. The sooner the forms are turned, the sooner the Scouts will be notified on which badge/NOVA to work on. If the Scouts wish to complete their NOVA Award at STEM U without getting a partial, they will also need to submit the NOVA form that provides details that they watched about 3 hours of STEM related TV shows. The pdf will also be available to download on receipt of payment. • All attending Scouters (Adults and Youth) should be in field uniform for the event. • Two registered event leaders from each Troop are required to supervise Scouts and required to stay on Campus at all times. If a single Scout comes from a Troop, a parent can serve as their supervision. • Attending leaders/parents will need to fill out the Unit Leader/Adult Registration section. • Attending leaders may be assigned to a class or group to assist the instructor, and also help out as hall monitors. Any Scout caught wandering around during class time, will be sent home. • NO food or drink is allowed in the classrooms. • Parking is available in lots C, D, and E.
• Scout Law and Oath – We are guests of the University of Missouri-St. Louis (UMSL). We are privileged, to be able to use this facility. Please be respectful to buildings and classrooms. Each Scout should conduct themselves in the true spirit of the Scout Law, Scout Oath, and the Outdoor Code. Please practice “leave no trace” during your visit. Each scout is responsible to help keep clean their assigned program area. • Scouts and leaders are not authorized to utilize other classrooms or buildings, other than the ones designated by UMSL for use of the Scouts. All classrooms will be clearly marked. • NO electronic devices allowed!! This is a learning environment. All cell phones should be placed on vibrate or turned off. • UMSL is not responsible for accidents and damaged or lost property. STAFF ARE STILL NEEDED to help. Any Scout leader can assist. Please contact Tom at tkroenung@stlbsa.org if you or others from your Troop are interested.